Brad Paisley is a well-respected guitarist, singer and songwriter whose talents have earned him a ton of accolades including three GRAMMYs, two American Music Awards, 14 Academy of Country Music Awards and 14 Country Music Association Awards (including Entertainer of the Year) and more. Brad has also been a proud member of the Grand Ole Opry since 2001 but did you know Paisley is also a visual artist. In January of 2018, Brad along with Rob Hendon painted a mural at the Bridgestone Arena in Nashville, Tennessee. The colorful work is located in the elevator lobby outside of section 109 on the building's main concourse. Weekend Warrior - Brad Paisley. "Well, I could always draw growing up," Paisley said humbly after five hours of painting that included producing the Predators primary and secondary logos freehand, just by looking at a picture of them. He shared that "when I started doing graffiti, I did it because I had this blank wall at my farm that was about as interesting as that gray wall over there," he continued. "It was nothing and its right behind my studio; it's where I want to be creative. I actually wrote on the wall, 'Sorry, this wall was boring me.' And that's kind of what was happening here. This was the most boring wall in Nashville five hours ago." Now it features Preds logos, the Nashville skyline, two guitars and an oversized catfish. 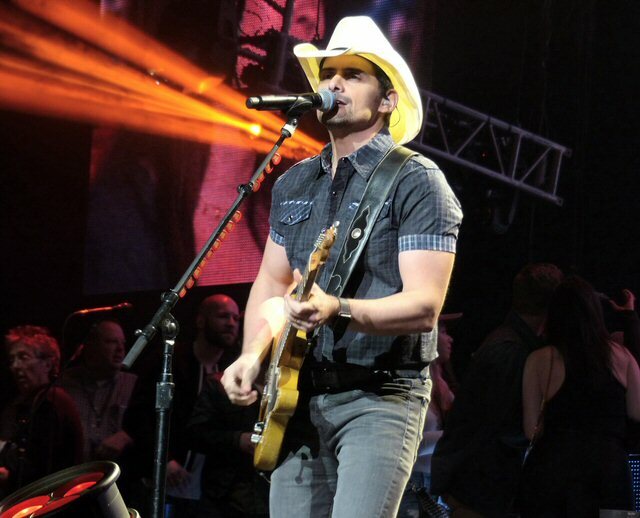 Brad Paisley was back at the Bridgestone Arena on April 06, 2018 as part of his super successful Weekend Warrior World Tour which includes special guests Broken Bow Records Platinum-selling artist Dustin Lynch, RED BOW Records hit-maker Chase Bryant and fast-rising star and multi-instrumentalist Lindsay Ell. Collectively they presented four-hours of high quality country rock to the Music City faithful concluding with an all-star jam during Brad's encore. Weekend Warrior - Dustin Lynch. Paisley is also an engaging entertainer. Brad along with his capable crew appeared a little after nine during the "Knight Rider Theme" running into the all to true "Last Time For Everything" that took a turn into Paisley Park with a colorful "Purple Rain" outro. Fans were clapping along to the "Mountain Music" intro that flowed into an agile "Old Alabama" and "Perfect Storm" both packed with portraits of girls and southern living. Lighting along with videos were used effectively throughout the show adding to the storytelling of Brad's songs. Many of the clips were quite humorous including "One Beer Can" and later a South Park treatment of "Celebrity" giving the classic a whole new life. The adventures of Brad Paisley was an animated piece created by the artist himself with nods to a number of cultural icons including the Beatles and Star Wars. Even in an arena Brad easily connected to the crowd. He spotted a sign and made a point of singing "Happy Birthday" to a female fan. Another young girl and her mother received a telecaster that Paisley just had drawn a Preds logo on - adding, "that's how you create the next Taylor Swift." He also mentioned those dying for the red, white and blue as a line of Army men stood on stage while Paisley thanked them for their service. Next, Chase Bryant battled Brad on the axe during "American Saturday Night." For his guest spot Dustin Lynch gave his host a goat named Telly in Wonder Woman attire including cape and boots. Later, Lindsay Eli shared a sip of "Whisky Lullaby" with a shot of burning guitar solos mixed in. Weekend Warrior - Chase Bryant. During the concert Brad had worked his way to a central platform getting closer to folks on that side of the room so he could tell the sketchy tale of "Cousins." He was back on the main stage for "I'm Gonna Miss Her (The Fishing Song)", "Mud on the Tires" and coming full circle to conclude with the timeless "Today." 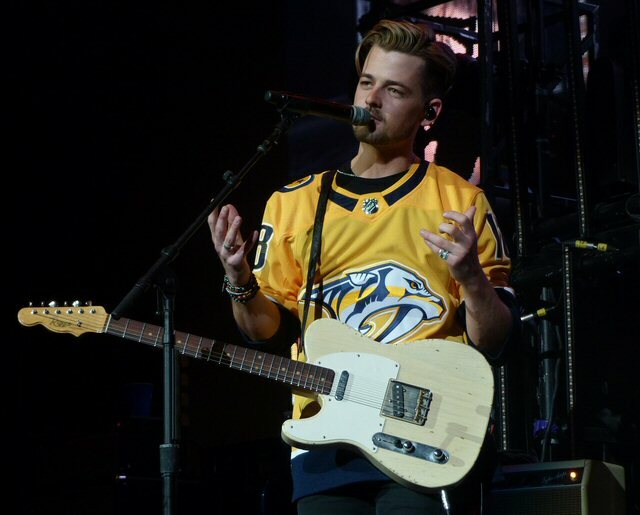 Everyone returned for a spirited "Alcohol" with three of the four artists sporting Preds paraphernalia as Paisley hopefully exclaimed "see you at the Stanley Cup." 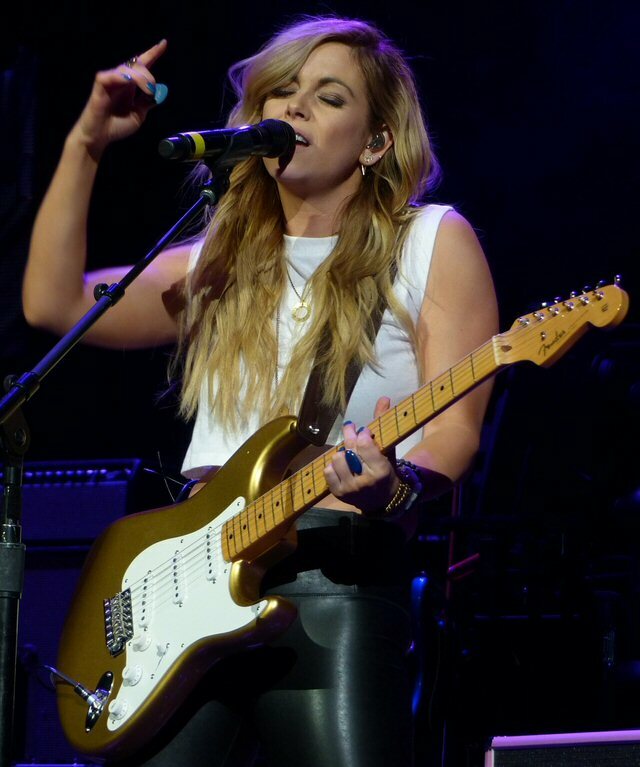 Opener Lindsay Ell demonstrated why The Huffington Post has listed her as a Top Country Artist to Watch. Lindsay Ell had a strong stage presence paired with singular vocals and she can shred with the best of them. Highlights of her captivating and catchy segment included "Champaign" and "Criminal." Chase Bryant grew up in a small town in Texas but hit the big city with a number of hits including "Little Bit of You" and "Take It Back" both were showcased during his engaging and energetic set that was a little bit blues, a little bit country and plenty rock and roll often spiked with sizzling guitar solos. Chase also gave a shout out to the military requesting everyone stand for those brave men and women before depicting a fine presentation of John Mellencamp's "Pink Houses." Weekend Warrior - Lindsay Ell. 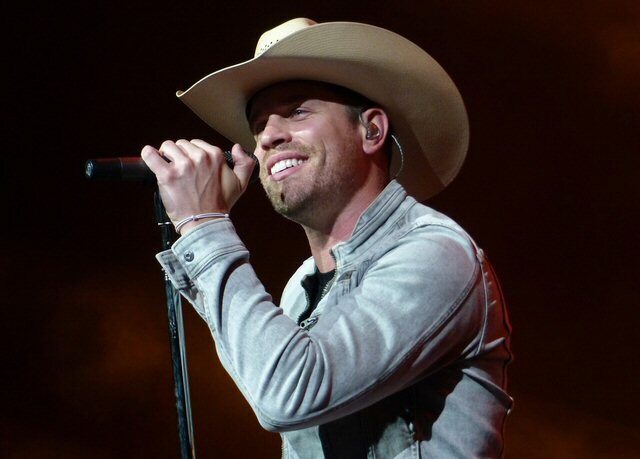 Dustin Lynch is on the rise with five consecutive #1s, three Top 5 albums, PLATINUM-level certifications and tours with the biggest names in country music. Dustin presented a show of reflective and rocking songs that included a tender tribute to his grandparents who will soon be celebrating their 63rd anniversary. "Cowboys and Angles" was one of a number of chart toppers that Lynch played. "Seein' Red" was a more sizzling moment. 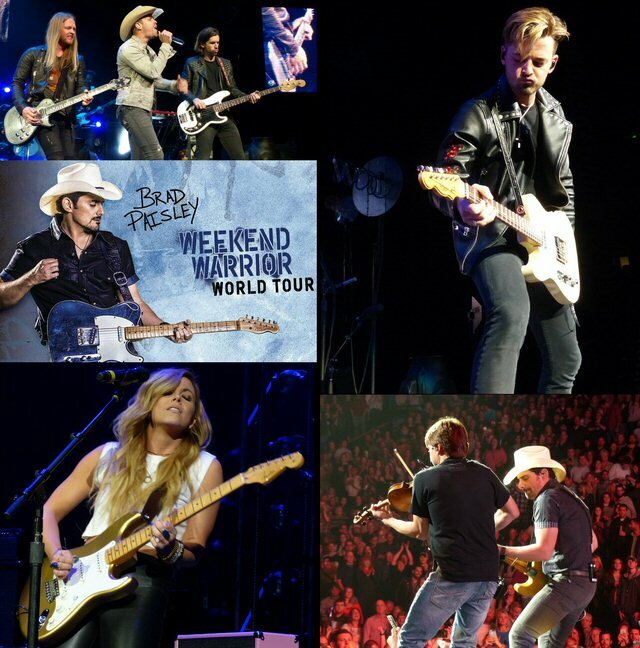 All three openers expressed appreciation to country radio, the fans and of course Brad who had organized this winning Weekend Warrior World Tour.